Basically it’s a slush, a slushy, a frozen drink or whatever other name you give to it – but with a difference. Most slush drinks are still, but Icees are not, they are carbonated so have a slight fizz to them, much like a regular soda drink. Obviously it’s hard to fully describe the flavour in words, so our advice is go and try one! We discovered the Icee drink in Florida while on holiday, but sadly at the time nowhere in the UK sold them. We had many Icees over the course of our two week holiday, and its safe to say we really enjoyed them! 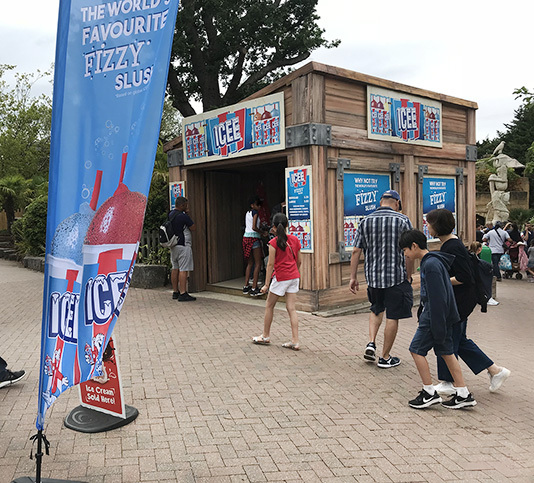 We then saw a tweet from Chessington World of Adventures to say that they now sell Icee’s – we assume this is the only place in the UK to sell them, it’s certainly the first place we have heard of that sells them! Seeing as we are Merlin Annual Pass holders, and enjoy visiting Chessington, we thought we’d take a trip! We live about 4 hours away from Chessington, so a round trip takes about 8 hours. This does seem like a lot to get an Icee, but obviously we made a full day of it. We decided to stay over and booked a cheap (ish) Premier Inn for the night. This resulted in us actually being able to visit both Thorpe Park and Chessington, which made the whole trip more value for money. In Chessington there is currently only one place that sells Icee’s and this is located in Forbidden Kingdom, close to the Gruffalo Arena. If you go to the area and face the stage, the Icee stall is located to the left. A large Icee costs £3.50, and a regular costs £3.25. Seeing as the price difference was so small, we went for large every time. When we visited the flavours on offer where: Blue Raspberry, Cherry, Carribean Crush, Vimto, Strawberry and Lemon. We tried most flavours and combinations throughout the day, and all tasted pretty good. My favourite was probably Blue Raspberry, followed by Cherry. It’s worth nothing that this stall ONLY accepts cash, this may change in the future, but it’s cash for now. I hope the Icees have been a big hit in Chessington, especially as the weather has been great over the past few months! This hopefully will mean that more Merlin attractions will start to offer Icees as an option, they may even be included as part of some refillable deal at some point, but who knows! We have contacted Merlin to hear their thoughts on this, so let’s see what they say! Icee is currently distributed in the UK by a company called Vimto, the same company that distributes Star Slush, Slurp, and a whole range of other products. We did write to Vimto to see if any other companies distributed the Icee drinks, but sadly they didn’t respond – bad Vimto! Anyway, if you pop to Chessington, or notice Icee’s being sold elsewhere, do let us know! It’s a great product, and would fit in really well with the other theme park drinks offerings! Previous Previous post: Merlin Annual Pass Long Weekend.